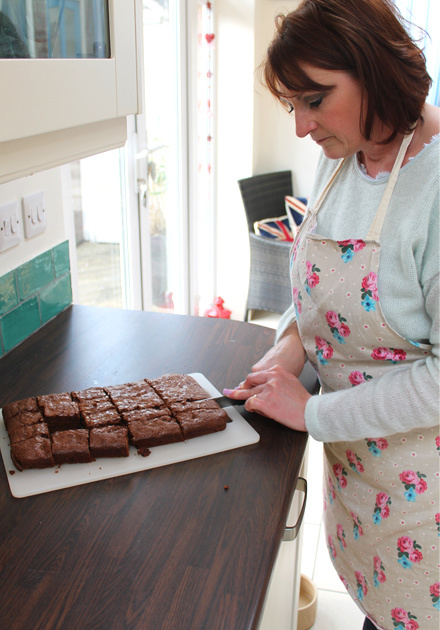 beloved Brownies came from Lisa Course, a mum of 3 baking for family & friends. They suggested she baked for a living. So she took some samples of cakes to a local coffee shop. That was nearly 3 years ago & now she supplies 4 local coffee shops. She sells many different flavours & types of cakes. The Brownies sell extremely well so from here she decided to come up with beloved Brownies! All ingredients used are of the finest quality. This includes local free range eggs, which are supplied from a local farm. Her own hens Blossom, Bluebell, Vivienne, Florence, Dotty, Betsy, Betty &Rita also supply some of the eggs. We have a wide variety of flavours for you to choose from which have all been tested on family & friends! The brownies are delivered in an organic brown box. They are carefully wrapped in cellophane, gift wrapped in either brown or blue tissue paper, and finally secured with the opposite colour satin ribbon. If you would like a handwritten message on the back of the tag please let me know. Each box contains 12 brownies of the flavour you choose. All orders are freshly homemade.